Abraham Lincoln re-enactor, Pete Raymond of Wooster, tells the story of Lincoln's life from birth to assassination in character as the 16th president. Pete Raymond has an uncanny resemblance to Abraham Lincoln. To the delight of all who see him, his exceptional portrayal of honest Abe brings history to life. 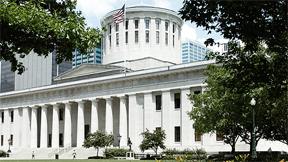 The Ohio Statehouse has joined the national movement to commemorate the 200th anniversary of the birth of Abraham Lincoln which occurred on February 12, 1809. Through educational programs, public forums and special events, the Ohio Statehouse Lincoln Bicentennial provides an opportunity for all Ohioans to learn about our nation's 16th President and the struggles he endured to hold the nation together.